OpenEI is growing into a global leader in the energy data realm - specifically analyses on renewable energy and energy efficiency. The platform is a wiki, similar to Wikipedia’s Wiki, with which many people are already familiar. Users can view, edit, and add data – and download data for free. We invite you to join our user community and get involved. With your help, we can provide the most current information needed to make informed decisions on energy, market investment, and technology development. Your data will also help create new businesses, build innovative tools and inspire new analyses. In addition to the Wiki, OpenEI provides a platform for sharing datasets. You can download data or upload your own, as well as rate and provide comments on the usefulness of the datasets. For more information about OpenEI, or how to get started with the platform, watch the feature video (above). Data quality is key to the success of OpenEI, and we are making every effort to ensure that only validated data with referenced sources are included in the platform. The user community can help expand the data and increase accuracy, which is what really strengthens this platform. In addition, we have data/content experts who will help evaluate submissions. Our information is enhanced by additional data that we are linking to via the semantic web, which encourages collaboration. 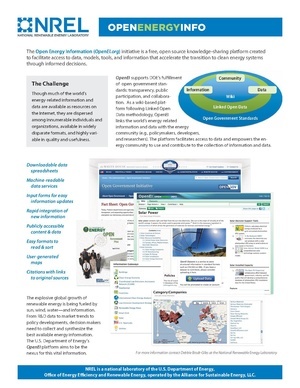 Partnering with a broad range of international organizations, OpenEI has become a common name in the energy data sector. OpenEI is looking for new partnerships, data providers and data consumers from the government, universities, industry, and the public/private sectors to join the effort. If you know of an organization that would like to work with OpenEI, please . OpenEI uses an agile development process in order to build tools that matter and that take advantage of the best new technologies. Please offer your feedback on how we can grow, add new datasets or even link with other services. Tell us how we are doing and let us know what we can do better. . Please see the updated list of OpenEI's international partners and sponsors to find what organizations are behind the power of OpenEI. Looking to provide proper attribution or promote OpenEI as part of your project? Get high-resolution logos and attribution requirements from our marketing page. This page was last modified on 24 January 2019, at 08:57.